Light microscopy is giving researchers new insights into the behaviour of a deadly malaria-causing parasite. Plasmodium falciparum accounts for 400,000 deaths each year. The parasite is very sensitive to light, making it difficult to study by light microscopy. Other challenges are its small size, its speed of cell invasion and ability to hide within host cells. 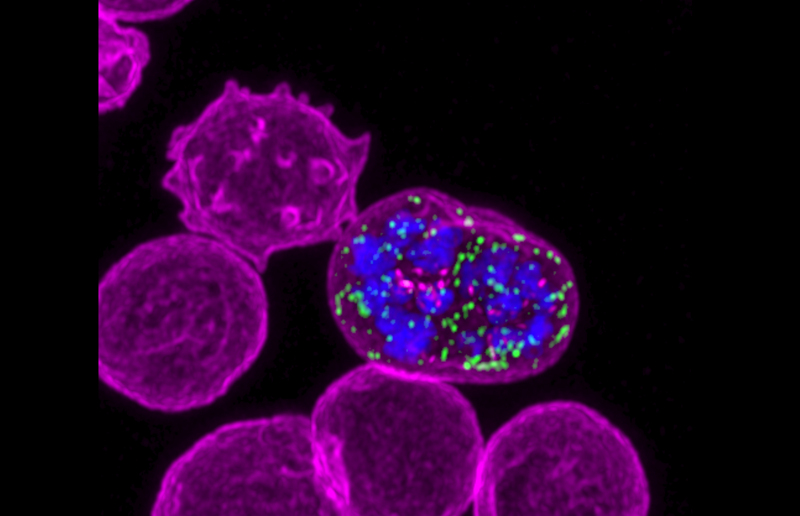 Super-resolution and lattice light sheet technologies are now providing unprecedented views of the parasite, helping researchers fill knowledge gaps in the search for effective antimalarial drugs. Dr Michał Pasternak studies how Plasmodium falciparum, the deadliest malaria-causing parasite, infects and modifies human red blood cells. For its survival, the parasite needs to export a large number of proteins into the infected cell. This protein trafficking provides an attractive target for the development of antimalarial drugs, but the mechanisms controlling this process are poorly understood. Together with Professor Alan Cowman from the Institute and Professor Jake Baum of Imperial College London, Dr Pasternak is trying to unravel the key steps of parasite protein export into the host cell. The Institute's Centre for Dynamic Imaging plays a central role in this research. Malaria parasites are difficult to study. A parasite will spend most of its life hidden from the immune system inside cells of the host, detectable only by high resolution microscopes. The study of live parasites is further complicated by their sensitivity to light. Additionally, both the invasion of the red blood cell by the parasite and the subsequent protein export are incredibly fast processes that can only be captured using the fastest microscopes. Dr Pasternak is working with Dr Kelly Rogers, head of the Centre for Dynamic Imaging, to develop protocols to image live parasites with a number of high-end microscopes. The team is now able to routinely use structured illumination microscopy (OMX Blaze) for super-resolution images of fixed parasites. They also perform super-resolution imaging of live parasites using Zeiss 880 equipped with the Airyscan detector. Together with Dr Niall Geoghegan, the team has developed protocols to obtain real-time 3D views of live invading parasites using lattice light sheet microscopy. These are technological milestones that will significantly change the imaging of live parasites. The emergence of multi-drug resistant P. falciparum strains is a major challenge for the future. The tools Dr Pasternak and his collaborators develop with the Centre for Dynamic Imaging will be available to other research groups looking to study live parasites with light microscopy. With new imaging technology our researchers are advancing understanding of the deadliest malaria-causing parasite and how to fight it. Dr Pasternak’s research is supported with funding from the European Molecular Biology Organization and the Wellcome Trust. Dr Michał Pasternak has been awarded a Sir Henry Wellcome Postdoctoral Fellowship to lead an international malaria study.